Author Barbara Harrison is mostly known for historical literary works and contemporary romance novels. 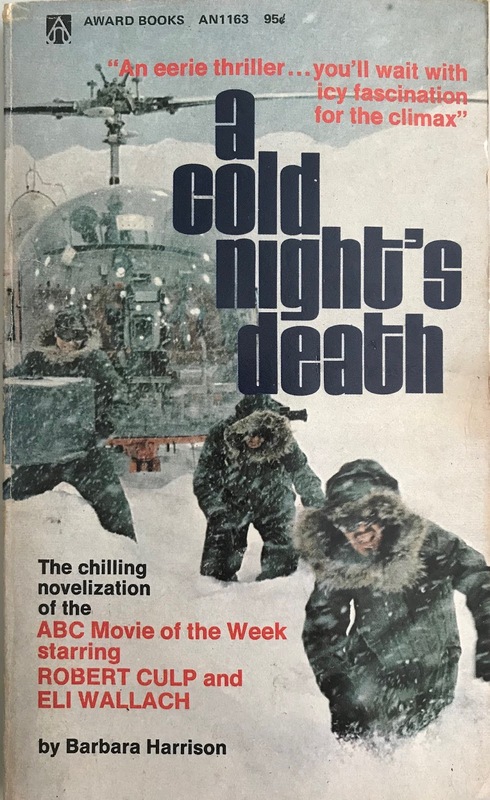 In 1973, Award Books assigned her the job of creating a novelization of an ABC made-for-television movie entitled “A Cold Night's Death”. Typically, movie novelizations are reserved for big screen releases or higher budget films needing additional marketing. It's a mystery on why Award wanted an ABC “movie of the week” in print, but alas here it is. I haven't seen the film (it's on YouTube) but couldn't resist the cover and promises of “Icy terror, suspense and violence”. Again, I haven't seen this film. But based on what I endured for 156-pages...I will never watch it. Perhaps Barbara Harrison was welded to the film's restraints, but reading “A Cold Night's Death” felt exactly like the novel's title. This is a lethargic, dull narrative where two scientists are literally thousands of miles from civilization and have nothing else to do but bicker with each other. And they drag you and I into it against our will. I wanted the suspenseful mystery that was teased to me during the novel's opening chapters. Tower Mountain sits 14,000 feet into the thin air of Northern California. It's a snowy, wind-swept Hell where a small research station houses a lone scientist. For reasons the reader doesn't know (spoiler: you never know), this scientist is at the peak of madness and broadcasting on the short-wave radio for help. Why? What has happened? In chapter two we are introduced to the book's two protagonists, Frank and Robert. Both are esteemed scientists that have worked together for a number of years on a dozen projects. Dr. Horner, the research leader (at ground control), has asked that Frank and Robert fly to this frozen wasteland to determine what has happened to the missing scientist and the monkeys that are being used for the grant experiment - the effects of high altitudes and stress on humans. Against their better judgment, both agree to the assignment. Chapter three begins with Frank and Robert arriving at the ice station and learning the whereabouts of the missing scientist. The mysteries here are aplenty – who locked the scientist in, why is there a window open, who destroyed the interior and how did the scientist die. I was hoping for an engaging hybrid of sleuth, murder and locked room mystery. The end result is nearly a three-month stay for Robert and Frank that includes a lot of experimentation on monkeys, radio dialogue with Dr. Horner and the two main characters jousting at each other like The Honeymooners. Barbara Harrison has nothing to offer more than Aaron Spelling and Leonard Goldberg's screenplay (no it isn't our beloved Lee Goldberg). That's the whole issue here...there's nothing to add because nothing really ever happens. There's some bump in the night suspense here and there, a few items knocked over and a lot of accusations tossed about. At the end I was dog-tired from this pointless exercise. Absolutely steer away from “A Cold Night's Death”. It's a soul killer.